While I’m all for widening the appeal and accessibility of fine Swiss watchmaking — something which brands like Montblanc and IWC strive to do on an ongoing basis — one mustn’t forgot that SIHH is an opportunity to showboat. The Salon is the first significant trade show of the year; bringing some 20,000 visitors to Geneva each January under the auspices of the industry’s most “exclusive” event — one that’s supposed to dwarf Baselworld, Watches & Wonders, and any other regional equivalent you care to mention. 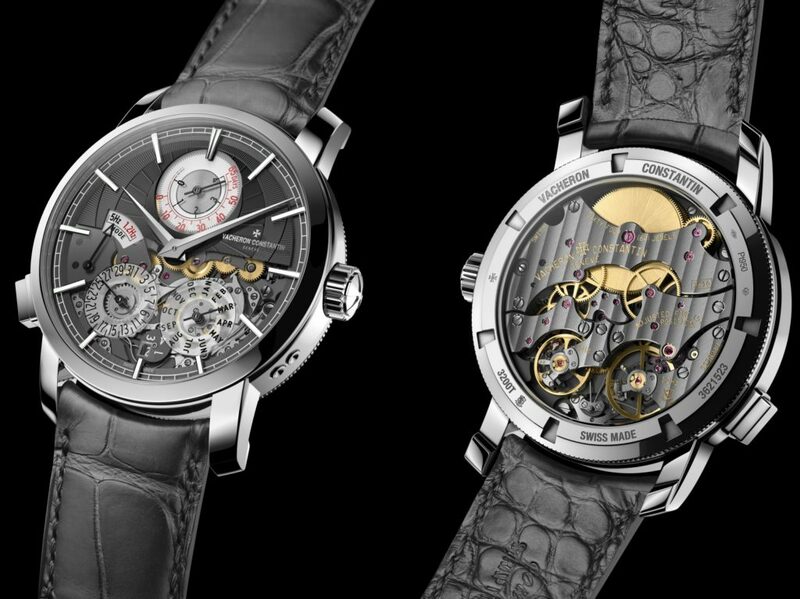 Unsurprisingly then, SIHH 2019 was a big moment for many of the industry’s key players, with novelties such as the Gyrotourbillon and Zeitwerk Date dominating conversation all over the trade show floor. Yet even by those standards, Vacheron Constantin managed to secure best-in-show plaudits, thanks to its new Traditionelle Twin Beat — a perpetual calendar watch that proposes a conceptually simple (yet mechanically dizzying) solution to an all too common problem. 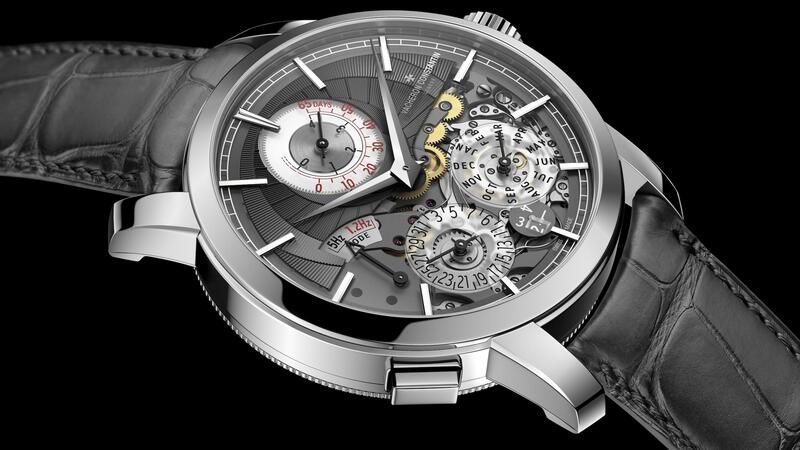 Despite an extremely complex movement geometry (incorporating two balance wheels, four differentials and an instantaneous perpetual calendar) Vacheron Constantin have somehow managed, as if by wizardry, to keep the Twin Beat to a very wearable 42mm. Traditionally, a core principle of mechanical watchmaking is that there can be very little deviation in a movement’s given power reserve. This is because in conventional watches the rate at which a movement outputs energy is more or less uniform (i.e. a human heart beating at a single unwavering rate), leading to significant power demands when complications are stacked on top of a basic hour & minute display. When it comes to perpetual calendars, a common issue arises when these watches run down. Traditional QP designs often don’t feature an easy method for manually resetting calendar indications, so when the watch falls out of sync (due to the winding down of the mainspring) it’s impossible to adjust without professional servicing. The Twin Beat resolves this problem by enabling wearers to manually switch between two operating frequencies — made possible by the inclusion of two balance wheels inside the movement. Twin Beat wearers can alternate between “Active” and “Standby” mode using a pusher set into the watch’s caseband at 8 o’clock. When the pusher is activated, a V-shaped lever (pictured lower centre) brakes the balance wheel currently in use, allowing the other wheel to commence oscillation. When worn daily, users set the watch to “Active mode”, relying upon a conventional wheel to deliver 4 days of power at an oscillation rate of 5hz. Conversely, in circumstances when the Twin Beat is going to go unworn for long periods, it can be set to “Standby mode”, causing the movement to switch to a larger low-frequency balance. The latter oscillates at 1.2hz and pairs a 4-segment wheel with an exceptionally fine hairspring — equivalent in size to a human hair. Operating at roughly 30 percent the capacity of its diminutive neighbour, the “Standby” balance wheel enables the Twin Beat to keep accurate time (perpetual calendar and all) for at least 65 days, even if it isn’t worn. As previously mentioned, it’s a beautifully simplistic idea for “increasing” the watch’s power reserve, but (as with many experiments in haute horlogerie) concept versus execution are two entirely different things. Ensuring the accurate operation of two balance wheels which users can switch seamlessly between presented VC with some hefty technical challenges. 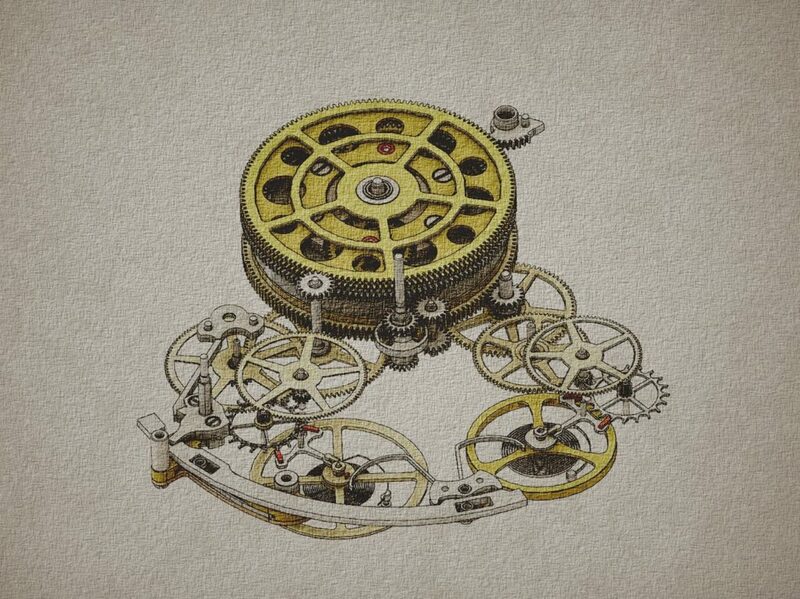 For starters, in order to operate independently, each balance needed to have its own gear train (you can clearly see both in the technical drawing above). This created a further complication in that these trains are reliant on a single barrel. In theory, if either were to stop (in order to isolate the connecting balance wheel), this would prevent the barrel from rotating, eventually causing the balance wheel that is in operation to come to a halt. Again, VC designers employed a mechanically simple fix for this problem by: (a) giving the barrel two mainsprings (capable of generating 4 and 65 days of power respectively); and (b) incorporating an internal differential so both could unwind even whilst one of the connecting balance wheels is stopped. Similar systems are used to output information to the Twin Beat’s power reserve indicator and minute/hour hands, bringing the total number of differentials to four. 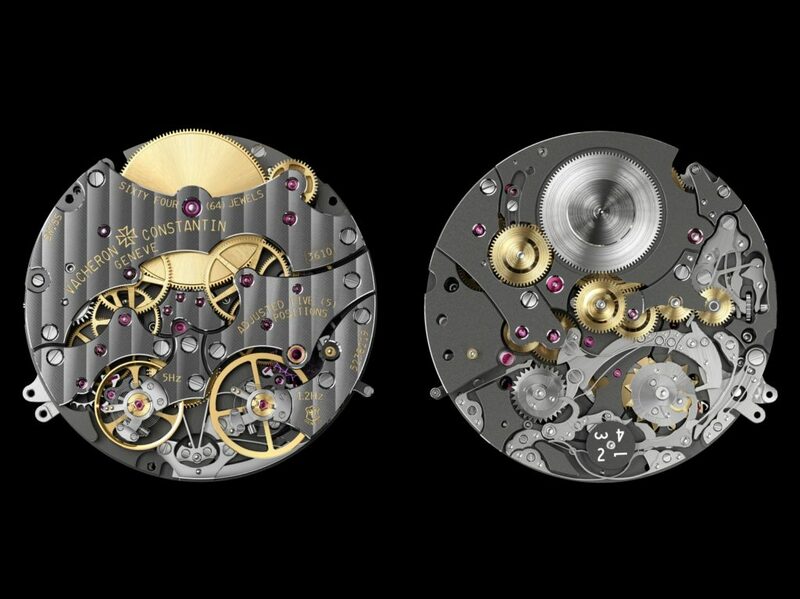 Vacheron Constantin are pushing the technology angle in most of the Twin Beat marketing material, but that doesn’t mean that the calibre 3610QP isn’t a gorgeous looking movement. Bridges are decorated with Côtes de Genève striping before being given an NAC coating to provide an additional layer of durability. Even after clearing all the obstacles which arise from employing two balance wheels, VC needed to find an energy and space efficient way to incorporate the Twin Beat’s calendar complication. Unlike many of the entry and mid-level brands we’ve covered, VC doesn’t do third party bolt-on QPs inside their watches. Instead, the instantaneous perpetual calendar (wherein all indications jump simultaneously at midnight) is integrated directly into the movement (the calibre 3610QP). Around 75 percent more efficient than the standard “dragging” perpetual calendar, the Twin Beat’s version eliminates much of the friction associated with the former by using a coiled spring and semi-toothed upper wheel. Through the inclusion of a proprietary dual balance wheel system – a first for Vacheron Constantin – the Twin Beat is able to maintain accurate perpetual calendar indications for upwards of 65 days. All this innovation would have been for naught if the Twin Beat had been ugly on the wrist; and while it’s certainly one of the more complicated looking SIHH 2019 novelties, its very wearable proportions and “high-low” dial treatment make for a compelling “dressy” option. 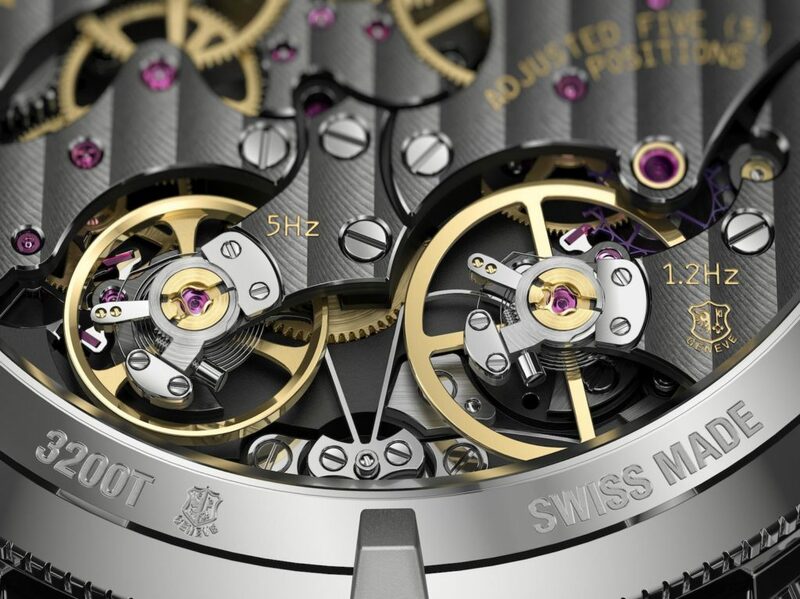 When you begin to appreciate just how complex the Twin Beat’s movement is, the fact that it fits neatly inside a 42mm case is nothing short of awe-inspiring. VC haven’t skimped on the dial either: when I first saw it in the proverbial metal, I was immediately struck by its dichotomous, almost two-faced nature. In the press briefing, VC’s designers explained that their goal was to create a dial which evoked both traditional and contemporary watch design; and I personally think they accomplished the difficult task of getting that balance right. The upper segment is fashioned from slate-coloured gold which has been decorated using hand-guillochage and sandblasting — a process that takes five hours. That provides good contrast (in colour and texture) to the lower dial segment, which is made using a transparent sapphire material that affords glimpses into the movement below. All display numerals (e.g. calendar indications, power reserve, oscillation frequency) are laser engraved, before being filled with a high contrast ink that provides good legibility to the wearer. Though in all likelihood, you’ll probably be too busy gawking at the movement as it switches seamlessly between Active and Standby mode. 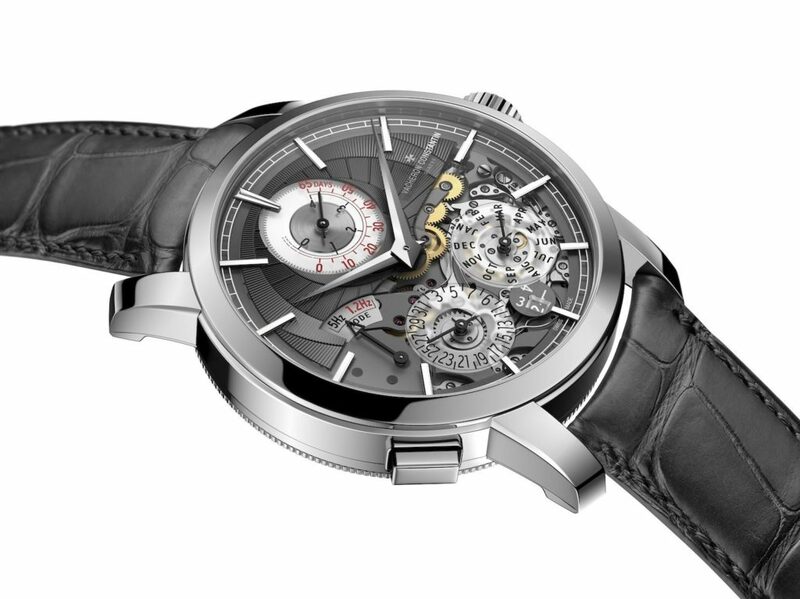 The Vacheron Constantin Traditionnelle Twin Beat Perpetual Calendar is available for HK$1.69 million. To learn more, visit Vacheron Constantin online.